The Kimberley offers visitors one of the most spectacularly rugged coastlines in the world – a place of soaring red cliffs and cascading waterfalls, tidal rivers lined with dense rainforest and sprawling mangroves. And all are teeming with wildlife. The area is virtually unspoilt, and for a very simple reason: it is remote. The only roads in the region are a very small number of 4WD tracks that are impassable during the wet season. So the very best way to explore the rugged coastline is obvious: by boat. There’s a series of cruising options to take in iconic and photogenic places like the Mitchell Falls, King George River and Falls and the remarkable Horizontal Falls in the Buccaneer Archipelago. Jumping-off places are Darwin and Broome. From the five-star (everything including helicopter trips) to more modest marine accommodations, generally speaking it’s a case of the smaller the boat the better to get up-close and personal with one of the most dramatic places on the planet. 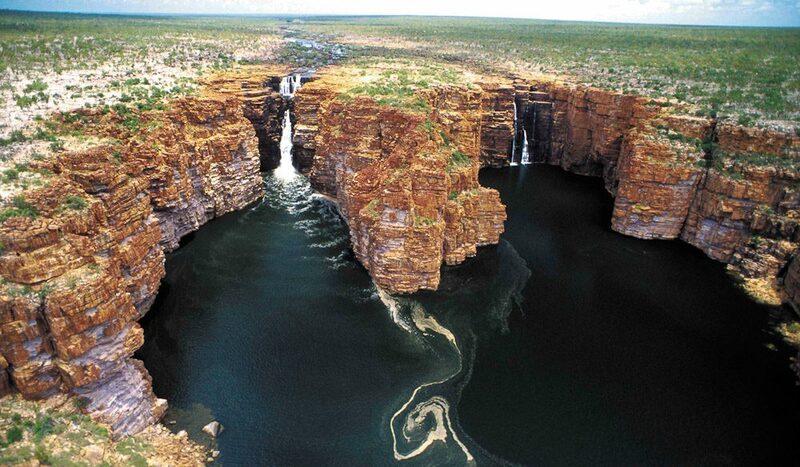 At 80m, the King George Falls are the highest single-drop falls in the Kimberley. For an overview of all the sights and destinations cruisers should try and see, you’ll find everything you need to know at www.kimberleycruising.com.au. This is a site for yachties, but helpful to all those planning to visit the Kimberly. The most popular jump-off point for Kimberly cruises is Broome – a terrific destination in its own right. Many cruise companies operate from Broome. The other jump-off point is Darwin. Wet – November to April. Very hot, humid and sticky. Subject to high rainfall and possible cyclones. Dry – May to October. Peak Season. 30 degrees in the daytime. Nights are crisp, and there is usually little or no chance of rain. Another reason for its popularity is the fact that this season coincides with the cold winters in all the southern areas of Australia. As the cruise season begins (from April), some humidity is still around. People choosing to cruise at this time could still experience some rainfall, and high temperatures. However, they will also be privileged to see the waterfalls at their most powerful and the Barramundi fishing at its best. Each cruise company has its own touring schedules, when various ships are available. Check with the operators. This is not an exhaustive list of useful websites, but many of these companies contributed to the Australian Traveller Top 100. Website with an excellent overview of the Kimberly cruising options.